Baby sewing is possible the most fun of all! It has been so many years since I have made bibs, I had completely forgotten that my newest grandchild just might need some. Two weeks ago, my daughter in law sent me a photo of Hazel having her first pizza bone ( that is what we have always called the crust of the pizza) and she was wearing a bib that was her oldest brother's who is now 8...YIKES! That is both great and not so great. Great because the bib she was wearing is STILL being used after it made it through TWO older brothers ( yay great bibs) and not so great because little Miss needs her own bibs! I went way back into the archives and found my free bib pattern! You can find it here. 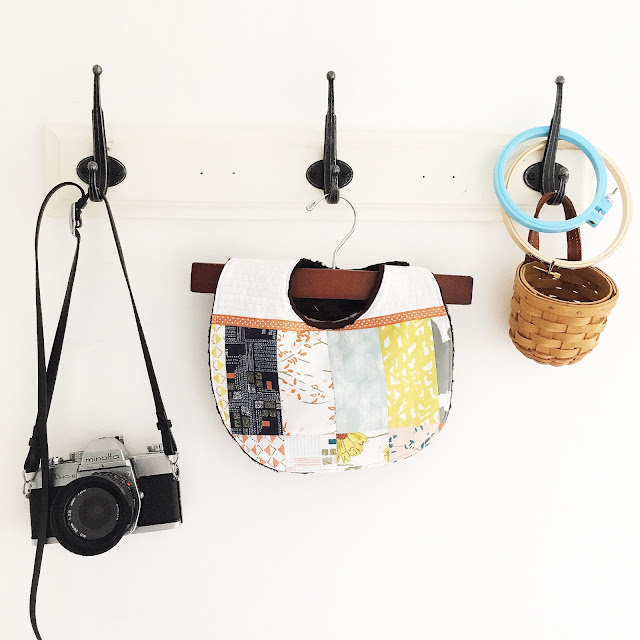 The first bib is made with Sharon Holland's Bountiful fabrics for Art Gallery Fabrics. This one is backed in minky and has beed quilted using Aurifil 50wt. Anna Maria Horner Butterflies are a must for my little one! Her amazing parents are great naturalists and all of the kids are outside with creatures all the time! Windham Fabrics Gardening is so much fun! I found these fabrics at Pineapple Fabrics! The minky back is water resistant so no spills will get through! Munki Munki Ice Cream Trucks! I have always loved this fun print! Another Windham Gardening bib! This one has batting in the middle and chickens on the back. This one is a reversible bib! Variety is the spice of life! I did make a few more bibs and will probably be making even more after Spring Break. Oh my goodness, I hope I will be able to get sewing done! I construct all of my bibs using Aurifil 40wt. The 40wt is a bit thicker and a good all purpose thread or high use item thread. The 40wt is the green spool. Bibs are HIGH use and this thread has been perfect without breaking with many washings! It also has the Oeko-Tex Standard 100 certification. "The STANDARD 100 by OEKO-TEX® is a worldwide consistent, independent testing and certification system for raw, semi-finished, and finished textile products at all processing levels, as well as accessory materials used." It is another way that Aurifil is dedicated to the quality of the process and the products presented to the consumer. If you make these bibs, I would LOVE to see them! Please tag me on Instagram, Facebook, Twitter or Pinterest! Thank you for the adorable pattern. Your photo staging is always so beautiful and always stands out in the crowd! You certainly have a gift! I have made bibs before and people sort of think you are a genius when you gift them. Can't wait to try out your version, I'm especially excited about not fiddling with ties. Thanks for the pattern and tips.